This article is about the place in Turkey. For other uses, see Mount Ararat (disambiguation). Mount Ararat (/ˈærəˌræt/ ARR-ə-rat; Turkish: Ağrı Dağı; Armenian: Մասիս, Masis and Արարատ, Ararat) is a snow-capped and dormant compound volcano in the extreme east of Turkey. It consists of two major volcanic cones: Greater Ararat and Little Ararat. Greater Ararat is the highest peak in Turkey and the Armenian plateau with an elevation of 5,137 m (16,854 ft); Little Ararat's elevation is 3,896 m (12,782 ft). 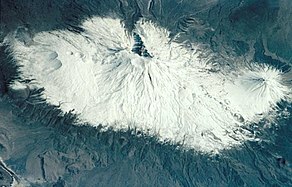 The Ararat massif is about 35 km (22 mi) wide at ground base. The first efforts to reach Ararat's summit were made in the Middle Ages. However, it was not until 1829 when Friedrich Parrot and Khachatur Abovian, accompanied by four others, made the first recorded ascent. Despite the scholarly consensus that the "mountains of Ararat" of the Book of Genesis (8:4) do not refer specifically to Mt. Ararat, it has been widely accepted in Christianity as the resting place of Noah's Ark. It is the principal national symbol of Armenia and has been considered a sacred mountain by Armenians. It is featured prominently in Armenian literature and art and is an icon for Armenian irredentism. Along with Noah's Ark, it is depicted on the coat of arms of Armenia. Mount Ararat forms a near-quadripoint between Turkey, Armenia, Azerbaijan and Iran. Its summit is located some 16 km (10 mi) west of both the Iranian border and the border of the Nakhchivan exclave of Azerbaijan, and 32 km (20 mi) south of the Armenian border. The Turkish–Armenian–Azerbaijani and Turkish–Iranian–Azerbaijani tripoints are some 8 km apart, separated by a narrow strip of Turkish territory containing the E99 road which enters Nakhchivan at 39°39′19″N 44°48′12″E﻿ / ﻿39.6553°N 44.8034°E﻿ / 39.6553; 44.8034. The traditional Armenian name is Masis (Մասիս [maˈsis]; sometimes Massis). However, nowadays, the terms Masis and Ararat are both widely, often interchangeably, used in Armenian. [b] The folk etymology expressed in Movses Khorenatsi's History of Armenia derives the name from king Amasya, the great-grandson of the legendary Armenian patriarch Hayk, who is said to have called the mountain Masis after himself. According to Russian orientalist Anatoly Novoseltsev the word Masis derives from Middle Persian masist, "the largest." According to Armenian historian Sargis Petrosyan the mas root in Masis means "mountain", cf. Proto-Indo-European *mņs-. According to archaeologist Armen Petrosyan it originates from the Māšu (Mashu) mountain mentioned in the Epic of Gilgamesh, which sounded Māsu in Assyrian. The Turkish name is Ağrı Dağı [aːɾɯ da.ɯ], Ottoman Turkish: اغـر طﺎﻍ‎ Ağır Dağ), i.e. "Mountain of Ağrı". Ağrı literally translates to "pain" or "sorrow". This name has been known since the late Middle Ages. Greater and Lesser Ararat are known as Büyük Ağrı and Küçük Ağrı, respectively. The traditional Persian name is کوه نوح, [ˈkuːhe ˈnuːh], Kūh-e Nūḥ, literally the "mountain of Noah". The Kurdish name of the mountain is çiyayê Agirî [t͡ʃɪjaːˈje aːgɪˈriː], which translates to "fiery mountain". 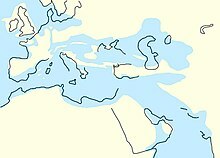 During the early Eocene and early Miocene, the collision of the Arabian platform with Laurasia closed and eliminated the Tethys Ocean from the area of what is now Anatolia. The closure of these masses of continental crust collapsed this ocean basin by middle Eocene and resulted in a progressive shallowing of the remnant seas, until the end of the early Miocene. Post-collisional tectonic convergence within the collision zone resulted in the total elimination of the remaining seas from East Anatolia at the end of early Miocene, crustal shortening and thickening across the collision zone, and uplift of the East Anatolian–Iranian plateau. Accompanying this uplift was extensive deformation by faulting and folding, which resulted in the creation of numerous local basins. The north–south compressional deformation continues today as evidenced by ongoing faulting, volcanism, and seismicity. Within Anatolia, regional volcanism started in the middle-late Miocene. During the late Miocene–Pliocene period, widespread volcanism blanketed the entire East Anatolian–Iranian plateau under thick volcanic rocks. This volcanic activity has continued uninterrupted until historical times. Apparently, it reached a climax during the latest Miocene–Pliocene, 6 to 3 Ma. During the Quaternary, the volcanism became restricted to a few local volcanoes such as Mount Ararat. These volcanoes are typically associated with north–south tensional fractures formed by the continuing north–south shortening deformation of Anatolia. In their detailed study and summary of the Quaternary volcanism of Anatolia, Yilmaz et al. recognized four phases to the construction of Mount Ararat from volcanic rocks exposed in glacial valleys deeply carved into its flanks. First, they recognized a fissure eruption phase of Plinian-subPlinian fissure eruptions that deposited more than 700 meters (2,300 ft) of pyroclastic rocks and a few basaltic lava flows. These volcanic rocks were erupted from approximately north northwest–south southeast-trending extensional faults and fissures prior to the development of Mount Ararat. Second, a cone-building phase began when the volcanic activity became localized at a point along a fissure. During this phase, the eruption of successive flows of lava up to 150 meters (490 ft) thick and pyroclastic flows of andesite and dacite composition and later eruption of basaltic lava flows, formed the Greater Ararat cone with a low conical profile. Third, during a climatic phase, copious flows of andesitic and basaltic lavas were erupted. During this phase, the current cones of Greater and Lesser Ararat were formed as eruptions along subsidiary fissures and cracks and flank occurred. 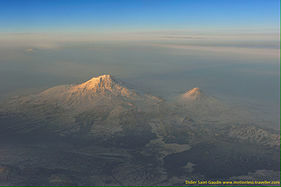 Finally, the volcanic eruptions at Mount Ararat transitioned into a flank eruption phase, during which a major north–south-trending fault offset the two cones that developed along with a number of subsidiary fissures and cracks on the volcano's flanks. Along this fault and the subsidiary fissures and cracks, a number of parasitic cones and domes were built by minor eruptions. One subsidiary cone erupted voluminous basalt and andesite lava flows. They flowed across the Doğubeyazıt plain and along the southerly flowing Sarısu River. These lava flows formed black ʻaʻā and pāhoehoe lava flows that contain well preserved lava tubes. The radiometric dating of these lava flows yielded radiometric ages of 0.4, 0.48 and 0.81 Ma. Overall, radiometric ages obtained from the volcanic rocks erupted by Mount Ararat range from 1.5 to 0.02 Ma. The chronology of Holocene volcanic activity associated with Mount Ararat is documented by either archaeological excavations, oral history, historical records, or a combination of these data, which provide evidence that volcanic eruptions of Mount Ararat occurred in 2500–2400 BC, 550 BC, possibly in 1450 AD and 1783 AD, and definitely in 1840 AD. Archaeological evidence demonstrates that explosive eruptions and pyroclastic flows from the northwest flank of Mount Ararat destroyed and buried at least one Kura–Araxes culture settlement and caused numerous fatalities in 2500–2400 BC. Oral histories indicated that a significant eruption of uncertain magnitude occurred in 550 BC and minor eruptions of uncertain nature might have occurred in 1450 AD and 1783 AD. According to the interpretation of historical and archaeological data, strong earthquakes not associated with volcanic eruptions also occurred the area of Mount Ararat in 139, 368, 851–893, and 1319 AD. During the 139 AD earthquake, a large landslide that caused many casualties and was similar to the 1840 AD landslide originated from the summit of Mount Ararat. 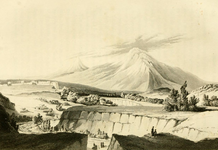 A phreatic eruption occurred on Mount Ararat on July 2, 1840 and pyroclastic flow from radial fissures on the upper north flank of the mountain and a possibly associated earthquake of magnitude 7.4 that caused severe damage and numerous casualties. Up to 10,000 people in the region died in the earthquake, including 1,900 villagers in the village of Akhuri (Armenian: Akori, modern Yenidoğan) who were killed by a gigantic landslide and subsequent debris flow. In addition, this combination of landslide and debris flow destroyed the Armenian monastery of St. Jacob near Akori, the town of Aralik, several villages, and Russian military barracks. It also temporarily dammed the Sevjur (Metsamor) River. The 13th century missionary William of Rubruck wrote that "Many have tried to climb it, but none has been able." 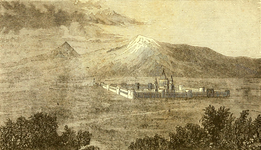 The Armenian Apostolic Church was historically opposed to ascents of Ararat on religious grounds. 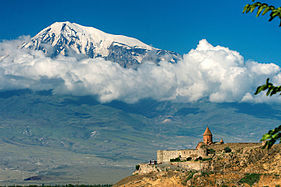 Thomas Stackhouse, an 18th-century English theologian, noted that "All the Armenians are firmly persuaded that Noah's ark exists to the present day on the summit of Mount Ararat, and that in order to preserve it, no person is permitted to approach it." In response to its first ascent by Parrot and Abovian, one high-ranking Armenian Apostolic Church clergyman commented that to climb the sacred mountain was "to tie the womb of the mother of all mankind in a dragonish mode." By contrast, in the 21st century to climb Ararat is "the most highly valued goal of some of the patriotic pilgrimages that are organized in growing number from Armenia and the Armenian diaspora." The first recorded ascent of the mountain in modern times took place on 9 October [O.S. 27 September] 1829. 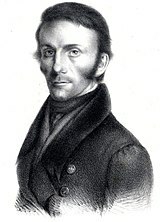 The Baltic German naturalist Friedrich Parrot of the University of Dorpat arrived at Etchmiadzin in mid-September 1829, almost two years after the Russian capture of Erivan, for the sole purpose of exploring Ararat. The prominent Armenian writer Khachatur Abovian, then a deacon and translator at Etchmiadzin, was assigned by Catholicos Yeprem, the head of the Armenian Church, as interpreter and guide. Parrot and Abovian crossed the Aras River into the district of Surmali and headed to the Armenian village of Akhuri on the northern slope of Ararat, 1,220 metres (4,000 ft) above sea level. They set up a base camp at the Armenian monastery of St. Hakob some 730 metres (2,400 ft) higher, at an elevation of 1,943 metres (6,375 ft). After two failed attempts, they reached the summit on their third attempt at 3:15 p.m. on October 9, 1829. The group included Parrot, Abovian, two Russian soldiers – Aleksei Zdorovenko and Matvei Chalpanov – and two Armenian Akhuri villagers – Hovhannes Aivazian and Murad Poghosian. Parrot measured the elevation at 5,250 metres (17,220 ft) using a mercury barometer. This was not only the first recorded ascent of Ararat, but also the second highest elevation climbed by man up to that date outside of Mount Licancabur in the Chilean Andes. Abovian dug a hole in the ice and erected a wooden cross facing north. Abovian also picked up a chunk of ice from the summit and carried it down with him in a bottle, considering the water holy. On 8 November [O.S. 27 October] 1829, Parrot and Abovian together with the Akhuri hunter Sahak’s brother Hako, acting as a guide, climbed up Lesser Ararat. an early account of an ascent of Mount Ararat. Other early notable climbers of Ararat included Russian climatologist and meteorologist Kozma Spassky-Avtonomov (August 1834), Karl Behrens (1835), German mineralogist and geologist Otto Wilhelm Hermann von Abich (29 July 1845), and British politician Henry Danby Seymour (1848). Later in the 19th century, two British politicians and scholars—James Bryce (1876) and H. F. B. Lynch (1893)—climbed the mountain. The first winter climb was by Turkish alpinist Bozkurt Ergör, the former president of the Turkish Mountaineering Federation, who climbed the peak on 21 February 1970. "Topography of Paradise" by German Jesuit scholar Athanasius Kircher from his 1675 book Arca Noë. In the northeast, in the mountains above Armenia, stands Mount Ararat, shown with a rectangular-shaped ark on the summit. According to the fourth verse of the eighth chapter of the Book of Genesis (Genesis 8:4), following a flood, Noah's Ark landed on the "mountains of Ararat" (Biblical Hebrew: הָרֵי אֲרָרָט, hare ararat). Most historians and Bible scholars agree that "Ararat" is the Hebrew name of Urartu, the geographic predecessor of Armenia and referred to the wider region at the time and not the mountain today known as Ararat. [c] Indeed, the phrase is translated as "mountains of Armenia" (montes Armeniae) in the Vulgate, the fourth century Latin translation of the Bible. Nevertheless, Mount Ararat is considered the traditional site of the resting place of Noah's Ark. It is therefore called a biblical mountain. Mount Ararat has been associated with the Genesis flood story since the 11–12th centuries. The local Armenian population began to identify it as the ark's landing place during those centuries. F. C. Conybeare wrote that the mountain was "a center and focus of pagan myths and cults [...] and it was only in the eleventh century, after these had vanished from the popular mind, that the Armenian theologians ventured to locate on its eternal snows the resting-place of Noah's ark." The 13th century Franciscan missionary William of Rubruck is usually considered the earliest reference for the tradition of Mount Ararat as the landing place of the ark in European literature. 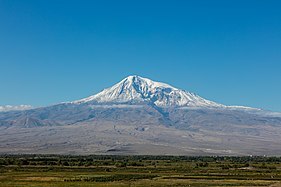 The 14th century English traveler John Mandeville is another early author who mentioned Mount Ararat, "where Noah's ship rested, and it is still there." Descent of Noah from Ararat by Ivan Aivazovsky (1889, National Gallery of Armenia) depicts Noah with his family, and a procession of animals, crossing the Ararat plain, following their descent from Mount Ararat, which is seen in the background. 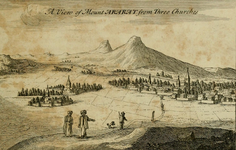 Most Christians identify Mount Ararat with the biblical "mountains of Ararat," despite the fact that six other landing places have been proposed, "largely because it would have been the first peak to emerge from the receding flood waters." Ararat is where the European tradition and most of Western Christianity place the landing of Noah's Ark. According to Spencer and Lienard the tradition "seems to be well entrenched in the Christian world." 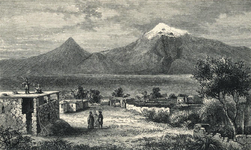 A 1722 biblical dictionary by Austin Calmet and the 1871 Jamieson-Fausset-Brown Bible Commentary both point to Mount Ararat as the place where tradition says the ark rested. American missionary H. G. O. Dwight wrote in 1856 that it is "the general opinion of the learned in Europe." 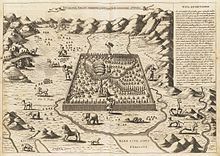 James Bryce, while admitting that the biblical passage implies that the ark rested upon a "mountain in the district which the Hebrews knew as Ararat, or Armenia", wrote in an 1878 article for the Royal Geographical Society that the biblical writer must have had Mt. Ararat in mind because it is so "very much higher, more conspicuous, and more majestic than any other summit in Armenia." During his visit to Armenia in 2001 Pope John Paul II declared in his homily in Yerevan's St. Gregory the Illuminator Cathedral: "We are close to Mount Ararat, where tradition says that the Ark of Noah came to rest." Patriarch Kirill of Moscow, the head of the Russian Orthodox Church, also mentioned Mount Ararat as the resting place of Noah's Ark in his speech at the Etchmiadzin Cathedral during his visit to Armenia in 2010. Those critical of this view point out that Ararat was the name of the country, not the mountain, at the time when Genesis was written. Arnold wrote in his 2008 Genesis commentary, "The location 'on the mountains' of Ararat indicates not a specific mountain by that name, but rather the mountainous region of the land of Ararat." Ararat has traditionally been the main focus of the searches for Noah's Ark. Augustin Calmet wrote in his 1722 biblical dictionary, "It is affirmed, but without proof, that there are still remains of Noah's ark on the top of this mountain; but M. de Tournefort, who visited this spot, has assured us there was nothing like it; that the top of mount Ararat is inaccessible, both by reason of its great height, and of the snow which perpetually covers it." Archaeological expeditions, sometimes supported by evangelical and millenarian churches, have been conducted since the 19th century in search of the ark. According to a 1974 book around 200 people from more than 20 countries claimed to have seen the Ark on Ararat since 1856. A fragment from the ark supposedly found on Ararat is on display at the museum of Etchmiadzin Cathedral, the center of the Armenian Church. Despite numerous reports of ark sightings (e.g. Ararat anomaly) and rumors, "no scientific evidence of the ark has emerged." Searches for Noah's Ark are considered by scholars an example of pseudoarchaeology. Kenneth Feder writes, "As the flood story itself is unsupported by any archaeological evidence, it is not surprising that there is no archaeological evidence for the existence of an impossibly large boat dating to 5,000 years ago." Ararat—located some 65 km (40 mi) south of the city–dominates the skyline of Armenia's capital Yerevan. Hayk, the legendary founding father of the Armenian people, as depicted by Mkrtum Hovnatanian (1779–1846). Ararat is pictured in the background. Despite lying outside the borders of the modern Republic of Armenia, Ararat has historically been associated with Armenia. [d] It is widely considered the country's principal national symbol and brand. The image of Ararat, usually framed within a nationalizing discourse, is ubiquitous in everyday material culture in Armenia. According to ethnographer Tsypylma Darieva Armenians have "a sense of possession of Ararat in the sense of symbolic cultural property." Ararat is known as the "holy mountain" of the Armenian people. It was principal to the pre-Christian Armenian mythology, where it was the home of the gods. With the rise of Christianity, the mythology associated with pagan worship of the mountain was lost. Ararat was the geographical center of ancient Armenian kingdoms. [e] One scholar defined the historic Greater Armenia (Major Armenia) as "the area about 200 miles [320 km] in every direction from Mount Ararat." In 19th-century era of romantic nationalism, when an Armenian state did not exist, Mt. Ararat symbolized the historical Armenian nation-state. In 1861 Armenian poet Mikael Nalbandian, witnessing the Italian unification, wrote to Harutiun Svadjian in a letter from Naples: "Etna and Vesuvius are still smoking; is there no fire left in the old volcano of Ararat?" The Genesis flood narrative was linked to the Armenian myth of origin by the early medieval historian Movses Khorenatsi. In his History of Armenia, he wrote that Noah and his family first settled in Armenia and later moved to Babylon. 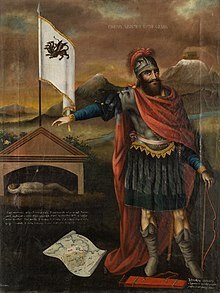 Hayk, a descendant of Japheth, a son of Noah, revolted against Bel (the biblical Nimrod) and returned to the area around Mount Ararat, where he established the roots of the Armenian nation. He is thus considered the legendary founding father and the name giver of the Armenian people. According to Razmik Panossian, this legend "makes Armenia the cradle of all civilisation since Noah's Ark landed on the 'Armenian' mountain of Ararat. […] it connects Armenians to the biblical narrative of human development. […] it makes Mount Ararat the national symbol of all Armenians, and the territory around it the Armenian homeland from time immemorial." 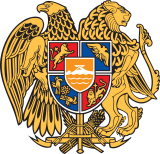 Mount Ararat has been depicted on the coat of arms of Armenia consistently since 1918. The First Republic's coat of arms was designed by architect Alexander Tamanian and painter Hakob Kojoyan. This coat of arms was readopted by the legislature of the Republic of Armenia on April 19, 1992, after Armenia regained independence. Ararat is depicted along with the ark on its peak on the shield on an orange background. The emblem of the Armenian Soviet Socialist Republic (Soviet Armenia) was created by the painters Martiros Saryan and Hakob Kojoyan in 1921. Mount Ararat is depicted in the center and makes up a large portion of it. In the aftermath of the Armenian Genocide of 1915, Ararat came to represent the destruction of the native Armenian population of eastern Turkey (Western Armenia) in the national consciousness of Armenians. [f] Ari L. Goldman noted in 1988, "In most Armenian homes in the modern diaspora, there are pictures of Mount Ararat, a bittersweet reminder of the homeland and national aspirations." Ararat has become a symbol of Armenian efforts to reclaim its "lost lands", i.e. the areas west of Ararat that are now part of Turkey that had significant Armenian population before the genocide. Adriaans noted that Ararat is featured as a sanctified territory for the Armenians in everyday banal irredentism. Stephanie Platz wrote, "Omnipresent, the vision of Ararat rising above Yerevan and its outskirts constantly reminds Armenians of their putative ethnogenesis … and of their exile from Eastern Anatolia after the Armenian genocide of 1915." Turkish political scientist Bayram Balci argues that regular references to the Armenian Genocide and Mount Ararat "clearly indicate" that the border with Turkey is contested in Armenia. Since independence from the Soviet Union in 1991, the Armenian government has not made official claims to any Turkish territory, however the Armenian government has avoided "an explicit and formal recognition of the existing Turkish-Armenian border." In a 2010 interview with Der Spiegel, Armenian President Serzh Sargsyan was asked whether Armenia wants "Mount Ararat back." Sargsyan, in response, said that "No one can take Mount Ararat from us; we keep it in our hearts. Wherever Armenians live in the world today, you will find a picture of Mount Ararat in their homes. And I feel certain that a time will come when Mount Ararat is no longer a symbol of the separation between our peoples, but an emblem of understanding. But let me make this clear: Never has a representative of Armenia made territorial demands. Turkey alleges this—perhaps out of its own bad conscience?" The most prominent party to lay claims to eastern Turkey is the nationalist Armenian Revolutionary Federation (Dashnaktsutyun). which claims it as part of what it considers United Armenia. In various settings, several notable individuals such as German historian Tessa Hofmann,[g] Slovak conservative politician František Mikloško,[h] Lithuanian political scientist and Soviet dissident Aleksandras Štromas[i] have spoken in support of Armenian claims over Mt. Ararat. 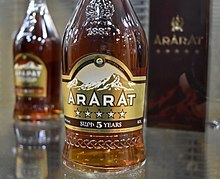 The mountain is notably featured on the Ararat brandy. Ethnographer Levon Abrahamian noted that Ararat is visually present for Armenians in reality (it can be seen from many houses in Yerevan and settlements in the Ararat plain), symbolically (through many visual representations, such as on Armenia's coats of arms), and culturally—in numerous and various nostalgic poetical, political, architectural representation. The first three postage stamps issued by Armenia in 1992 after achieving independence from the Soviet Union depicted Mt. Ararat. Ararat is depicted on the logos of two of Armenia's leading universities—the Yerevan State University and the American University of Armenia. It is depicted on the logos of Football Club Ararat Yerevan (since the Soviet times) and the Football Federation of Armenia. The logo of Armavia, Armenia's now defunct flag carrier, also depicted Ararat. The publications of the Social Democrat Hunchakian Party in Lebanon (Ararad daily) and California, U.S. (Massis weekly) are both named for the mountain. The Ararat brandy, produced by the Yerevan Brandy Company since 1887, is considered the most prestigious Eastern European brandy. Hotels in Yerevan often advertise the visibility of Ararat from their rooms, which is seen as a major advantage for tourists. Ararat was depicted in the books of European, including many British, travelers in the 18th–19th centuries who visited Armenia. 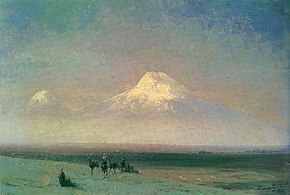 According to one source, the first Armenian artist to depict the mountain was Ivan Aivazovsky, who created a painting of Ararat during his visit to Armenia in 1868. 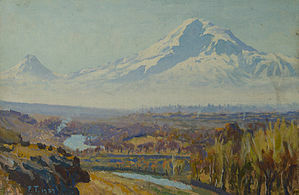 Other major Armenians artists who painted Ararat include Yeghishe Tadevosyan, Gevorg Bashinjaghian, Martiros Saryan, and Panos Terlemezian. Rouben Paul Adalian suggested that "there is probably more poetry written about Mount Ararat than any other mountain on earth." Travel writer Rick Antonson described Ararat as the "most fabled mountain in the world." 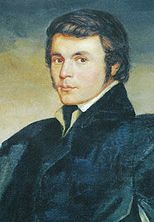 In his Journey to Arzrum (Путешествие в Арзрум; 1835–36), the celebrated Russian poet Aleksandr Pushkin recounted his travels to the Caucasus and Armenia at the time of the Russo-Turkish War (1828–29). Russian Symbolist poet Valery Bryusov often referred to Ararat in his poetry and dedicated two poems to the mountain,[k] which were published in 1917. 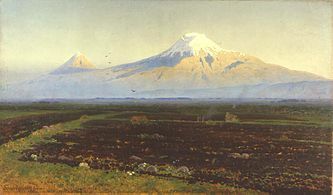 Bryusov saw Ararat as the embodiment of antiquity of the Armenian people and their culture. Russian poet Osip Mandelstam wrote fondly of Ararat during his 1933 travels in Armenia. "I have cultivated in myself a sixth sense, an 'Ararat' sense," the poet wrote, "the sense of an attraction to a mountain." During his travels to Armenia, Soviet Russian writer Vasily Grossman observed Mount Ararat from Yerevan standing "high in the blue sky." He wrote that "with its gentle, tender contours, it seems to grow not out of the earth but out of the sky, as if it has condensed from its white clouds and its deep blue. It is this snowy mountain, this bluish-white sunlit mountain that shone in the eyes of those who wrote the Bible." In The Maximus Poems (1953) American poet Charles Olson, who grew up near the Armenian neighborhood in Worcester, Massachusetts, compares the Ararat Hill near his childhood home to the mountain and "imagines he can capture an Armenian's immigrant perspective: the view of Ararat Hill as Mount Ararat." Several major episodes in Declare (2001) by Tim Powers take place on Mt. Ararat. In the book, it is the focal point of supernatural happenings. Several paintings of Mt. Ararat for sale at the Yerevan Vernissage. Mt. Ararat is featured prominently in Armenian literature. According to Meliné Karakashian, Armenian poets "attribute to it symbolic meanings of unity, freedom, and independence." According to Kevork Bardakjian, in Armenian literature, Ararat "epitomizes Armenia and Armenian suffering and aspirations, especially the consequences of the 1915 genocide: almost total annihilation, loss of a unique culture and land [...] and an implicit determination never to recognize the new political borders." The last two lines of Yeghishe Charents's 1920 poem "I Love My Armenia" (Ես իմ անուշ Հայաստանի) read: "And in the entire world you will not find a mountaintop like Ararat's. / Like an unreachable peak of glory I love my Mount Masis." In a 1926 poem dedicated to the mountain Avetik Isahakyan wrote: "Ages as though in second came, / Touched the grey crest of Ararat, / And passed by...! [...] It's now your turn; you too, now, / Stare at its high and lordly brow, / And pass by...!" Mount Ararat is the most frequently cited symbol in the poetry of Hovhannes Shiraz. In collection of poems, Knar Hayastani (Lyre of Armenia) published in 1958, there are many poems "with very strong nationalist overtones, especially with respect to Mount Ararat (in Turkey) and the irredentism it entailed." In one such poem, "Ktak" (Bequest), Shiraz bequeaths his son Mt. Ararat to "keep it forever, / As the language of us Armenians, as the pillar of your father’s home." The first lines of Paruyr Sevak's 1961 poem "We Are Few..." (Քիչ ենք, բայց հայ ենք) read: "We are few, but they say of us we are Armenians. / We do not think ourselves superior to anyone. / Clearly we shall have to accept / That we, and only we, have an Ararat" In one short poem Silva Kaputikyan compares Armenia to an "ancient rock-carved fortress", the towers of which are Ararat and Aragats. "Holy Mountains", the 8th track of the album Hypnotize (2005) by System of a Down, an American rock band composed of four Armenian Americans, "references Mount Ararat [...] and details that the souls lost to the Armenian Genocide have returned to rest here." "Here's to You Ararat" is a song from the 2006 album How Much is Yours' of Arto Tunçboyacıyan's Armenian Navy Band. The 2002 film Ararat by Armenian-Canadian filmmaker Atom Egoyan features Mt. Ararat prominently in its symbolism. The 2011 documentary film Journey to Ararat on Parrot and Abovian's expedition to Ararat was produced in Estonia by filmmaker Riho Västrik. It was screened at the Golden Apricot International Film Festival in Yerevan in 2013. 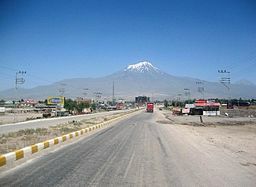 In Armenia, there is a province, two cities (Ararat, Masis), and two villages (Ararat, Masis) named after the mountain. The Turkish province of Ağrı was named for the mountain (its Turkish name) in 1927, while the provincial capital city of Karaköse was renamed to Ağrı in 1946. In the United States, a river in Virginia and North Carolina was named after the mountain no later than 1770. An unincorporated community in North Carolina was later named after the river. There is a township and a mountain in Pennsylvania called for the mountain. In the Australian state of Victoria, a city was named Ararat in 1840. Its local government area is also called Ararat. 96205 Ararat is an asteroid named in the mountain's honor. It was discovered in 1992 by Freimut Börngen and Lutz D. Schmadel at Tautenburg Observatory in Germany. The name was proposed by Börngen. Besides Ararat being the Hebrew version of Urartu, this Iron Age state is often referred to as the "Araratian Kingdom" or the "Kingdom of Ararat" (Armenian: Արարատյան թագավորություն, Arartyan t’agavorut’yun) in Armenian historiography. Levon Abrahamian noted that the name gives a "biblical and an Armenian touch to this ancient state." The First Republic of Armenia, the first modern Armenian state that existed between 1918 and 1920, was sometimes called the Araratian Republic or the Republic of Ararat (Armenian: Արարատյան Հանրապետություն, Araratyan hanrapetut’yun) as it was centered in the Ararat plain. In 1927 the Kurdish nationalist party Xoybûn led by Ihsan Nuri, fighting an uprising against the Turkish government, declared the independence of the Republic of Ararat (Kurdish: Komara Agiriyê‎), centered around Mt. Ararat. ^ Strabo, Geographica, XI.14.2 and XI.14.14. They are also transliterated as Abus and Nibarus. 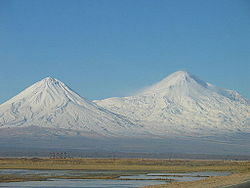 Abos and Nibaros are the two peaks of Ararat according to scholars such as Nicholas Adontz, Vladimir Minorsky, Julius Fürst. ^ The peaks are sometimes referred to in plural as Մասիսներ Masisner. Greater Ararat is known as simply Masis or Մեծ Մասիս (Mets Masis, "Great/Big Masis"). While Lesser Ararat is known as Sis (Սիս) or Փոքր Մասիս (P′ok′r Masis, "Little/Small Masis"). The word "Ararat" occurs in Armenian literature from the early medieval period, following the invention of the Armenian alphabet. Richard James Fischer: "The Genesis text, using the plural "mountains" (or hills), identifies no particular mountain, but points generally toward Armenia ("Ararat" being identical with the Assyrian "Urartu") which is broadly embraces that region." Bill T. Arnold: "Since the ancient kingdom of Ararat/Urartu was much more extensive geographically than this isolated location in Armenia, modern attempts to find remaints of Noah's ark here are misguided." Vahan Kurkjian: "It has long been the notion among many Christians that Noah's Ark came to rest as the Flood subsided upon the great peak known as Mount Ararat; this assumption is based upon an erroneous reading of the 4th verse of the VIIIth chapter of Genesis. That verse does not say that the Ark landed upon Mount Ararat, but upon "the mountains of Ararat." Now, Ararat was the Hebrew version of the name, not of the mountain but of the country around it, the old Armenian homeland, whose name at other times and in other tongues appears variously as Erirath, Urartu, etc." ^ Armenians have been called the "people of Ararat" by authors of at least two books. Italian diplomat and historian Luigi Villari wrote in 1906: "Almost the whole history of the Armenian people centres round Mount Ararat." ^ "...Mt. Ararat, which was the geographical center of the ancient Armenian kingdoms..."
"The sacred mountain stands in the center of historical and traditional Armenia..."
"To the Armenians it is the ancient sanctuary of their faith, the centre of their once famous kingdom, hallowed by a thousand traditions." ^ "The lands of Western Armenia which Mt. Ararat represent..." "mount Ararat is the symbol of banal irredentism for the territories of Western Armenia"
^ Hofmann suggested that "the return of the ruins of Ani and of Mount Ararat [by Turkey to Armenia], both in the immediate border area could be considered as a convincing gesture of Turkey's apologies and will for reconciliation." ^ Mikloško stated at a 2010 conference on Turkey's foreign policy: "Mount Ararat [represents the] Christian heritage of Armenians. Does modern Turkey consider the possibility of giving the mount back to Armenians? The return of Ararat would be an unprecedented step to signify Turkey’s willingness to build a peaceful future and promote its image at the international scene." ^ Štromas wrote: "The Armenians would also be right to claim from Turkey the Ararat Valley, which is an indivisible part of the Armenian homeland containing the main spiritual center and supreme symbol of Armenia's nationhood, the holy Mountain of Ararat itself." ^ Central Bank of the Republic of Turkey. Banknote Museum: 6. Emission Group – One Hundred Turkish Lira – I. Series, II. Series & III. Series. ^ "100 World Mountains ranked by primary factor". ii.uib.no. Institutt for informatikk University of Bergen. ^ Bjørstad, Petter E. (August 2007). "Ararat Trip Report". ii.uib.no. University of Bergen. Archived from the original on 21 October 2017. ^ "Ağrı Dağı Milli Parkı [Ağrı Dağı National Park]". ormansu.gov.tr (in Turkish). Republic of Turkey Ministry of Forest and Water Management. ^ a b c d e f g h i Yilmaz, Y.; Güner, Y.; Saroğlu, F. (1998). "Geology of the quaternary volcanic centres of the east Anatolia". Journal of Volcanology and Geothermal Research. 85 (1–4): 173–210. Bibcode:1998JVGR...85..173Y. doi:10.1016/s0377-0273(98)00055-9. ^ Short, Nicholas M.; Blair, Robert W., eds. (1986). "Mt. Ararat, Turkey". Geomorphology From Space: A Global Overview of Regional Landforms. National Aeronautics and Space Administration. p. 226. ^ a b de Planhol, X. (1986). "Ararat". Encyclopædia Iranica. ^ Hovannisian, Richard G. (1973). "Armenia and the Caucasus in the Genesis of the Soviet-Turkish Entente". International Journal of Middle East Studies. 4 (2): 129–147. doi:10.1017/s0020743800027409. JSTOR 162238. 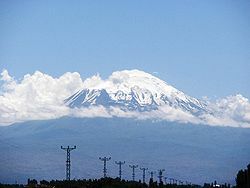 ...Nationalist Turkey annexed the Surmalu district, embracing Mount Ararat, the historic symbol of the Armenian people. ^ de Waal, Thomas (2015). Great Catastrophe: Armenians and Turks in the Shadow of Genocide. Oxford University Press. p. 86. ISBN 978-0199350698. ^ a b Parrot 2016, p. xxiii. ^ Yildiz, Kerim; Taysi, Tanyel B. (2007). The Kurds in Iran: The Past, Present and Future. London: Pluto Press. p. 71. ISBN 978-0745326696. ^ Tsutsiev, Arthur (2014). Atlas of the Ethno-Political History of the Caucasus. Translated by Nora Seligman Favorov. New Haven: Yale University Press. p. 92. ISBN 978-0300153088. ^ Westerman, Frank (2008-12-02). Ararat: In Search of the Mythical Mountain. Random House. ISBN 978-1-4070-1951-2. ^ a b c Arnold 2008, p. 104. ^ Bonomi, Joseph (1866). "Ararat". In Fairbairn, Patrick. The Imperial Bible-Dictionary: Historical, Biographical, Geographical and Doctrinal - Volume I. Glasgow: Blackie and Son. p. 118. ^ a b c d Hewsen, Robert H. (2001). "Armenia: The Physical Setting—Mt. Ararat". Armenia: A Historical Atlas. University of Chicago Press. p. 15. ISBN 978-0-226-33228-4. ^ a b Bryce 1877, p. 198. ^ a b Petrossyan 2010, p. 220. ^ a b "Մասիսներ [Masisner]". encyclopedia.am (in Armenian). ^ a b Peroomian, Rubina (2007). "Historical Memory: Threading the Contemporary Literature of Armenia". In Hovannisian, Richard. The Armenian Genocide: Cultural and Ethical Legacies. Transaction Publishers. p. 113. ISBN 9781412835923. ...the majestic duo of Sis and Masis (the two peaks of Mount Ararat) that hover above the Erevan landscape are constant reminders of the historical injustice. ^ Delitzsch, Franz (2001). New Commentary on Genesis. Wipf and Stock Publishers. p. 274. ISBN 978-1-57910-813-7. The Armenians call Little Ararat sis and Great Ararat masis, whence it seems that great, the meaning of meds, is contained in ma. ^ Hovhannisyan, L. Sh. (2016). Բառերի մեկնությունը հինգերորդ դարի հայ մատենագրուտյան մեջ [Interpretation of words in 5th century Armenian manuscripts] (in Armenian). Yerevan: Gitutyun. p. 61. ^ Khorenatsi 1978, p. 91. ^ a b Petrossyan 2010, p. 221. ^ a b c Novoseltsev 1978. ^ Dalton, Robert H. (2004). Sacred Places of the World: A Religious Journey Across the Globe. Abhishek. p. 133. ISBN 9788182470514. The Turkish name for Mt Ararat is Agri Dagi (which means mountain of pain). ^ a b Sarıkaya, Mehmet Akif (2012). "Recession of the ice cap on Mount Ağrı (Ararat), Turkey, from 1976 to 2011 and its climatic significance". Journal of Asian Earth Sciences. 46: 190–194. Bibcode:2012JAESc..46..190S. doi:10.1016/j.jseaes.2011.12.009. ^ "Xortekî tirk dixwaze bi bîsîklêtê xwe ji çiyayê Agirî berde xwarê" (in Kurdish). Rudaw Media Network. 19 June 2014. ^ Waugh, Alexander (27 August 2008). "Will he, won't He? Ararat by Frank Westerman, translated by Sam Garrett". The Spectator. ^ Merriam-Webster's Geographical Dictionary (3rd ed.). Springfield, Massachusetts: Merriam-Webster. 2001. p. 63. ISBN 9780877795469. ^ Haggett, Peter, ed. (2002). "Turkey". Encyclopedia of World Geography: The Middle East (2nd ed.). Marshall Cavendish. p. 2026. ISBN 978-0-7614-7289-6. ^ Hartemann, Frederic; Hauptman, Robert (2005). The Mountain Encyclopedia. Lanham, Maryland: Taylor Trade. p. 17. ISBN 978-0-8108-5056-9. ^ Galichian, Rouben (2004). Historic Maps of Armenia: The Cartographic Heritage. I.B. Tauris. p. 26. ISBN 978-1-86064-979-0. ^ "Maps of Ararat - Ararat Map, Turkey (Agri Dagi)". turkeyodyssey.com. Terra Anatolia. Archived from the original on 2007-02-25. ^ According to Petter E. Bjørstad, Head of Informatics Department at the University of Bergen (Norway). "Ararat Trip Report". ii.uib.no. August 2007. Archived from the original on 11 October 2017. I measured the summit elevation, averaging more than 300 samples in my GPS, it settled on 5132 meter, 5 meter lower than the often quoted 5137 figure. This clearly shows that the 5165 meter elevation that many sources use is wrong. The summit is a snow ridge with no visible rock anywhere. Thus, the precise elevation will change with the seasons and could definitely be influenced by climate change (global warming). Later GPS measurements in Iran suggested that the GPS data may be about 10 meter too high also in this part of the world. This would in fact point in the direction of a true Ararat elevation around 5125 meter. ^ a b c Blumenthal, M. M. (1958). "Vom Agrl Dag (Ararat) zum Kagkar Dag. Bergfahrten in nordostanatolischen Grenzlande". Die Alpen (in German). 34: 125–137. ^ a b Sarıkaya, Mehmet Akif; Tekeli, A. E. (2014). "Satellite inventory of glaciers in Turkey". In J. S. Kargel; et al. Global Land Ice Measurements from Space. New York: Springer-Verlag. pp. 465–480. ISBN 978-3540798170. ^ a b Birman, J. H. (1968). "Glacial Reconnaissance in Turkey". Geological Society of America Bulletin. 79 (8): 1009–1026. Bibcode:1968GSAB...79.1009B. doi:10.1130/0016-7606(1968)79[1009:GRIT]2.0.CO;2. ^ a b Dewey, J. F.; Hempton, M. R.; Kidd, W. S. F.; Saroglum, F.; Sengὃr, A. M. C. (1986). "Shortening of continental lithosphere: the neotectonics of Eastern Anatolia – a young collision zone". In Coward, M. P.; Ries, A. C. Collision Tectonics. Geological Society of London. pp. 3–36. ^ a b c d Karakhanian, A.; Djrbashian, R.; Trifonov, V.; Philip, H.; Arakelian, S.; Avagian, A. (2002). "Holocene–Historical Volcanism and Active Faults as Natural Risk Factor for Armenia and Adjacent Countries". Journal of Volcanology and Geothermal Research. 113 (1): 319–344. Bibcode:2002JVGR..113..319K. doi:10.1016/s0377-0273(01)00264-5. ^ a b c d Karakhanian, A.S.; Trifonov, V.G. ; Philip, H.; Avagyan, A.; Hessami, K.; Jamali, F.; Bayraktutan, M. S.; Bagdassarian, H.; Arakelian, S.; Davtian, V.; Adilkhanyan, A. (2004). "Active faulting and natural hazards in Armenia, Eastern Turkey and North-Western Iran". Tectonophysics. 380 (3–4): 189–219. Bibcode:2004Tectp.380..189K. doi:10.1016/j.tecto.2003.09.020. ^ Allen, Mark B.; Mark, Darren F.; Kheirkhah, Monireh; Barfod, Dan; Emami, Mohammad H.; Saville, Christopher (2011). "40Ar/39Ar dating of Quaternary lavas in northwest Iran: constraints on the landscape evolution and incision rates of the Turkish–Iranian plateau". Geophysical Journal International. 185 (3): 1175–1188. Bibcode:2011GeoJI.185.1175A. doi:10.1111/j.1365-246x.2011.05022.x. ^ a b Siebert, L., T. Simkin, and P. Kimberly (2010) Volcanoes of the world, 3rd ed. University of California Press, Berkeley, California. 551 pp. ISBN 978-0-520-26877-7. ^ a b Haroutiunian, R. A. (2005). "Катастрофическое извержение вулкана Арарат 2 июля 1840 года [Catastrophic eruption of volcano Ararat on 2 july, 1840]". Proceedings of the National Academy of Sciences of the Republic of Armenia: Earth Sciences (in Russian). 58 (1): 27–35. ISSN 0515-961X. ^ Taymaz, Tuncay; Eyidog̃an, Haluk; Jackson, James (1991). "Source parameters of large earthquakes in the East Anatolian fault zone (Turkey)". Geophysical Journal International. 106 (3): 537–550. Bibcode:1991GeoJI.106..537T. doi:10.1111/j.1365-246x.1991.tb06328.x. ^ a b William of Rubruck (1998). The Journey of William of Rubruck to the Eastern Parts of the World, 1253–55. Translated by W. W. Rockhill. New Delhi: Asian Educational Services. p. 269–270. ISBN 978-81-206-1338-6. [...] mountains in which they say that Noah's ark rests; and there are two mountains, the one greater than the other; and the Araxes flows at their base [...] Many have tried to climb it, but none has been able. [...] An old man gave me quite a good reason why one ought not to try to climb it. They call the mountain Massis [...] "No one," he said, "ought to climb up Massis; it is the mother of the world." ^ Stackhouse, Thomas (1836). A History of the Holy Bible. Glasgow: Blackie and Son. p. 93. ^ Siekierski, Konrad (2014). ""One Nation, One Faith, One Church": The Armenian Apostolic Church and the Ethno-Religion in Post-Soviet Armenia". In Agadjanian, Alexander. Armenian Christianity Today: Identity Politics and Popular Practice. Ashgate Publishing. p. 14. ISBN 978-1-4724-1273-7. ^ a b Randveer, Lauri (October 2009). "How the Future Rector Conquered Ararat". University of Tartu. ^ Khachaturian, Lisa (2011). Cultivating Nationhood in Imperial Russia: The Periodical Press and the Formation of a Modern Armenian Identity. Transaction Publishers. p. 52. ISBN 978-1-4128-1372-3. ^ Giles, Thomas (27 April 2016). "Friedrich Parrot: The man who became the 'father of Russian mountaineering'". Russia Beyond the Headlines. Retrieved 19 April 2017. ^ Ketchian, Philip K. (December 24, 2005). "Climbing Ararat: Then and Now". The Armenian Weekly. 71 (52). Archived from the original on September 8, 2009. ^ Parrot 2016, p. 141-142. ^ Fairbairn, Patrick (1866). "Ararat". The Imperial Bible-Dictionary: Historical, Biographical, Geographical and Doctrinal – Volume I. p. 119. ^ Polo, Marco; Yule, Henry (2010). The Book of Ser Marco Polo, the Venetian: Concerning the Kingdoms and Marvels of the East, Volume 1. Cambridge University Press. p. 49. ISBN 978-1-108-02206-4. ^ a b Bryce, James (1878). "On Armenia and Mount Ararat". Proceedings of the Royal Geographical Society of London. 22 (3): 169–186. doi:10.2307/1799899. JSTOR 1799899. ^ Lynch, H. F. B. (1893). "The ascent of Ararat". The Geographical Journal. 2: 458. ^ Lynch, H. F. B. (1901). Armenia, travels and studies. Volume I: The Russian Provinces. London: Longmans, Green, and Co. p. 176. ^ "Conquering the legendary Mount Ararat". Hürriyet Daily News. 15 January 2006. ^ Spar, Ira (2003). "The Mesopotamian Legacy: Origins of the Genesis tradition". In Aruz, Joan. Art of the First Cities: The Third Millennium B.C. from the Mediterranean to the Indus. New York: Metropolitan Museum of Art. p. 488. ISBN 978-1-58839-043-1. ^ Morgenstern, Julian (1941). "Psalm 48". Hebrew Union College Annual. 16: 1–95. JSTOR 23502992. Note the plural, hare 'Ararat; not "Mt. Ararat," as traditionally translated and interpreted, but rather "(one of) the mountains of Ararat," i. e. of Urartu or Armenia. ^ a b Richard James Fischer (2007). "Mount Ararat". Historical Genesis: From Adam to Abraham. University Press of America. pp. 109–111. ISBN 9780761838074. ^ a b Arnold 2008, p. 105. ^ Kurkjian, Vahan (1964) . A History of Armenia. New York: Armenian General Benevolent Union of America. p. 2. ^ Room, Adrian (1997). Placenames of the World: Origins and Meanings. McFarland. p. 34. ISBN 9780786401727. ^ a b c Vos, Howard F. (1982). "Flood (Genesis)". In Bromiley, Geoffrey W. International Standard Bible Encyclopedia: E-J (fully revised ed.). Wm. B. Eerdmans Publishing. p. 319. ISBN 978-0-8028-3782-0. ^ Tremblais, Jean-Louis (16 July 2011). "Ararat, montagne biblique". Le Figaro (in French). "Biblical mountain's glaciers shrinking". News24. 8 August 2010. ^ a b Avagyan, Ṛafayel (1998). Yerevan—heart of Armenia: meetings on the roads of time. Union of Writers of Armenia. p. 17. The sacred biblical mountain prevailing over Yerevan was the very visiting card by which foreigners came to know our country. ^ Bailey, Lloyd R. (1990). "Ararat". In Mills, Watson E.; Bullard, Roger Aubrey. Mercer Dictionary of the Bible. Mercer University Press. p. 54. ISBN 978-0-86554-373-7. ...the local (Armenian) population called Masis and which they began to identify as the ark's landing place in the eleventh-twelfth centuries. ^ Conybeare, F. C. (1901). "Reviewed Work: Ararat und Masis. Studien zur armenischen Altertumskunde und Litteratur by Friedrich Murad". The American Journal of Theology. 5 (2): 335–337. doi:10.1086/477703. JSTOR 3152410. Masis was anyhow a center and focus of pagan myths and cults, which the author enumerates; and it was only in the eleventh century, after these had vanished from the popular mind, that the Armenian theologians ventured to locate on its eternal snows the resting-place of Noah's ark. ^ Mandeville, John (2012). The Book of Marvels and Travels. Translated by Anthony Bale. Oxford University Press. p. 70. ISBN 9780199600601. ...there's another mountain called Ararat; the Jews call this Thano, where Noah's ship rested, and it is still there. One can glimpse it from afar in clear weather, and the mountain is seven miles high. ^ Mandel, Jerome (2013). "Ararat, Mount". In Friedman, John Block; Figg, Kristen Mossler. Trade, Travel, and Exploration in the Middle Ages: An Encyclopedia. Routledge. p. 30. ISBN 978-1-135-59094-9. ^ "Նոյն իջնում է Արարատից (1889) [Descent of Noah from Ararat (1889)]" (in Armenian). National Gallery of Armenia. ^ a b original title: Dictionnaire historique, critique, chronologique, geographique et literal de la Bible. English translation: Calmet, Augustin (1830). "Ararat". Calmet's Dictionary of the Holy Bible: With the Biblical Fragments, Volume 1. Charles Taylor (translator). London: Holdsworth and Ball. p. 178–179. "...a famous mountain in Armenia, on which the ark is said to have rested, after the deluge." ^ Jamieson, Robert; Fausset, Andrew Robert; Brown, David (1871). Commentary Critical and Explanatory on the Whole Bible. view Genesis 8:4 commentary online "...mountain which tradition points to as the one on which the ark rested." ^ Dwight 1856, p. 189: "The mountain on which, according to ancient Armenian tradition, and the general opinion of the learned in Europe, the ark of Noah rested after the deluge, is called in Armenian Masis, and in Turkish Aghur Dagh..."
^ Patai, Raphael; Oettinger, Ayelet (2015). "Ararat". In Patai, Raphael; Bar-Itzhak, Haya. Encyclopedia of Jewish Folklore and Traditions. Routledge. pp. 50–51. ISBN 9780765620255. ^ Balsiger, David; Sellier Jr., Charles E. (1974). In Search of Noah's Ark. Sunn Classic Books. p. 203. ^ Zenian, David (1 July 1996). "The Holy Etchmiadzin Museum: History of a Long Journey". AGBU Magazine. ^ Mayell, Hillary (27 April 2004). "Noah's Ark Found? Turkey Expedition Planned for Summer". National Geographic. pp. 1, 2. ^ Cline, Eric H. (2009). Biblical Archaeology: A Very Short Introduction. Oxford University Press. p. 72. ISBN 978-0-19-534263-5. ^ Fagan, Garrett G. (2006). Archaeological Fantasies: How Pseudoarchaeology Misrepresents the Past and Misleads the Public. Psychology Press. p. 69. ISBN 978-0-415-30592-1. ^ Feder, Kenneth L. (2010). "Noah's Ark". Encyclopedia of Dubious Archaeology: From Atlantis to the Walam Olum: From Atlantis to the Walam Olum. ABC-CLIO. pp. 195–196. ISBN 978-0-313-37919-2. ^ a b Boniface, Brian; Cooper, Chris; Cooper, Robyn (2012). Worldwide Destinations: The Geography of Travel and Tourism (6th ed.). Taylor & Francis. p. 338. ISBN 978-0-415-52277-9. The snow-capped peak of Ararat is a holy mountain and national symbol for Armenians, dominating the horizon in the capital, Erevan, yet it is virtually inaccessible as it lies across the border in Turkey. ^ Lydolph, Paul E. (1979). Geography of the U.S.S.R., Topical Analysis. Misty Valley Publishing. p. 46. ...about 65 kilometers south of Yerevan where Mount Ararat reaches an elevation of 5156 meters. ^ Gabrielian, M. C. (1892). The Armenians: or the People of Ararat. Philadelphia: Allen, Lane & Scott. ^ Burtt, Joseph (1926). The People of Ararat. London: L. and Virginia Woolf at the Hogarth Press. OCLC 3522299. ^ Villari, Luigi (1906). Fire and Sword in the Caucasus. London: T. Fisher Unwin. p. 215. ^ Boltyansky, Boris (24 October 2015). "Солнце мое" (in Russian). lenta.ru. Библейский Арарат, символ страны, стал главным брендом Армении. ^ Adriaans 2011, p. 35. ^ Companjen, Françoise; Marácz, László Károly; Versteegh, Lia, eds. (2010). Exploring the Caucasus in the 21st Century: Essays on Culture, History and Politics in a Dynamic Context. Amsterdam University Press. pp. 12–13. ISBN 9789089641830. ^ Melton, J. Gordon (2010). 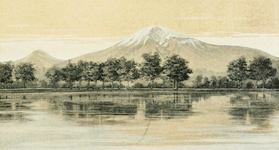 "Ararat, Mount". In Melton, J. Gordon; Baumann, Martin. Religions of the World: A Comprehensive Encyclopedia of Beliefs and Practices (2nd ed.). ABC-CLIO. p. 164. ISBN 978-1-59884-204-3. ^ a b Adalian, Rouben Paul (2010). Historical Dictionary of Armenia. Lanham, Maryland: Scarecrow Press. p. 85. ISBN 978-0-8108-7450-3. ^ Lottman, Herbert R. (29 February 1976). "Despite Ages of Captivity, The Armenians Persevere". The New York Times. p. 287. ^ Bryce 1877, p. 234. ^ Maxoudian, Noubar (1952). "Early Armenia as an empire: The career of Tigranes III, 96–55 B.C". Journal of the Royal Central Asian Society. 39 (2): 156–163. doi:10.1080/03068375208731438. ^ a b Shirinian, Lorne (1992). The Republic of Armenia and the rethinking of the North-American Diaspora in literature. Edwin Mellen Press. p. 78. ISBN 978-0773496132. ^ Hacikyan, Agop Jack; Basmajian, Gabriel; Franchuk, Edward S.; Ouzounian, Nourhan (2005). The Heritage of Armenian Literature: From the eighteenth century to modern times. Detroit: Wayne State University Press. p. 292. ISBN 9780814332214. ^ Khorenatsi 1978, p. 85. ^ Panossian 2006, p. 51. ^ Panossian 2006, pp. 51–52. ^ "State symbols of the Republic of Armenia". president.am. Office to the President of the Republic of Armenia. ^ Meier, Reinhard (1975). "Soviet Armenia Today". Swiss Review of World Affairs. 25–26. 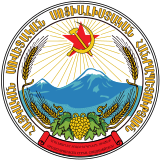 The impressive mountain also has its place as the central image in the coat of arms of the Armenian Soviet Republic (coupled, of course, with a five-pointed Soviet star). ^ Adriaans 2011, p. 48. ^ Johnson, Jerry L. (2000). Crossing Borders – Confronting History: Intercultural Adjustment in the Post-Cold War World. Lanham, Maryland: University Press of America. pp. 6–7. ISBN 978-0-7618-1536-5. Armenians view Mount Ararat as both a symbol of the Genocide and loss of hallowed land. ^ Goldman, Ari L. (18 December 1988). "A History Full of Anguish and Agony; The Armenians, Still 'Like Job's People'". The New York Times. ^ Adriaans 2011, p. 40. ^ "Armenian protest against Erdogan visit turns violent". The Daily Star. 26 November 2010. Retrieved 28 June 2013. ^ a b Balci, Bayram (2014). "Between ambition and realism: Turkey's engagement in the South Caucasus". In Agadjanian, Alexander; Jödicke, Ansgar; van der Zweerde, Evert. Religion, Nation and Democracy in the South Caucasus. Routledge. p. 260. ISBN 978-1-317-69157-0. Armenia has not officially expressed territorial claims in respect of Turkey but the regular references to the genocide and to Mount Ararat, a national symbol for Armenians which is situated in contemporary Turkey, clearly indicates that the border with their eastern neighbour is contested. ^ Phillips, David L. (2005). Unsilencing the Past: Track Two Diplomacy and Turkish-Armenian Reconciliation. New York: Berghahn Books. p. 68. ISBN 978-1-84545-007-6. ^ Danielyan, Emil (28 July 2011). "Erdogan Demands Apology From Armenia". Radio Free Europe/Radio Liberty. ^ Bidder, Benjamin (6 April 2010). "Serge Sarkisian on Armenian-Turkish Relations: 'We Wanted to Break Through Centuries of Hostility'". Der Spiegel. ^ Harutyunyan, Arus (2009). Contesting National Identities in an Ethnically Homogeneous State: The Case of Armenian Democratization. Kalamazoo, Michigan: Western Michigan University. p. 89. ISBN 978-1-109-12012-7. ^ "Return of ruins of Ani and of Mount Ararat could be considered as convincing gesture of Turkey's apologies: Tessa Hofmann". Armenpress. 16 April 2015. ^ "Frantisek Miklosko demands that Turkey return Biblical Mount Ararat to Armenians". PanARMENIAN.Net. 14 September 2010. ^ Shtromas, Alexander (2003). Faulkner, Robert K.; Mahoney, Daniel J., eds. Totalitarianism and the Prospects for World Order: Closing the Door on the Twentieth Century. Lexington Books. p. 387. ISBN 978-0-7391-0534-4. ^ a b Healey, Barth (23 August 1992). "STAMPS; For Armenia, Rainbows And Eagles in Flight". The New York Times. ^ Abrahamian, Levon (2007). "Dancing around the mountain: Armenian identity through rites of solidarity". In Grant, Bruce; Yalçın-Heckmann, Lale. Caucasus Paradigms: Anthropologies, Histories and the Making of a World Area. Berlin: Lit Verlag. pp. 167–188. ISBN 9783825899066. ^ Ritman, Alex (17 August 2012). "My Kind of Place: Yerevan has thrived through conquest". The National. ^ Khachatrian, Shahen. ""Поэт моря" ["The Sea Poet"]" (in Russian). Center of Spiritual Culture, Leading and National Research Samara State Aerospace University. Archived from the original on 19 March 2014. ^ "Martiros Sarian (1880–1972) View of Mount Ararat from Yerevan". Christie's. 3 June 2013. ^ Jeffrey, David L. (1992). A Dictionary of Biblical Tradition in English Literature. Wm. B. Eerdmans Publishing. p. 287. ISBN 9780802836342. ^ Wordsworth, William (1838). The Sonnets of William Wordsworth: Collected in One Volume, with a Few Additional Ones, Now First Published. E. Moxon. p. 209. ^ Pushkin, Aleksandr (1974). A Journey to Arzrum. Translated by Birgitta Ingemanson. Ann Arbor: Ardis. p. 50. ISBN 978-0882330679. ^ Mandelstam, Osip (2011). A Journey to Armenia. Translated by Sidney Monas. London: Notting Hill Editions. p. 91. ISBN 9781907903472. ^ Grossman, Vasily (2013). An Armenian Sketchbook. Translated by Robert Chandler; Elizabeth Chandler. Introduction by Robert Chandler and Yury Bit-Yunan. New York: New York Review Books. p. 24. ISBN 9781590176184. ^ Siraganian, Lisa (2012). Modernism's Other Work: The Art Object's Political Life. Oxford University Press. p. 156. ISBN 978-0-19-979655-7. ^ Karakashian, Meliné (1998). "Armenia: A Country's History of Challenges". Journal of Social Issues. 54 (2): 381–392. doi:10.1111/j.1540-4560.1998.tb01225.x. ^ a b Bardakjian, Kevork B., ed. (2000). "Hovhannes Širaz". A Reference Guide to Modern Armenian Literature, 1500–1920: With an Introductory History. Wayne State University Press. p. 227. ISBN 978-0814327470. ^ "I Love My Armenia by Yeghishe Charents". Ararat. 15: 46. 1960. ^ Ter-Khachatryan, Yervand (11 December 2014). "Բանաստեղծը Ռավեննայում". Azg (in Armenian). Archived from the original on April 11, 2016. ^ Chrysanthopoulos, Leonidas (2002). Caucasus Chronicles: Nation-building and Diplomacy in Armenia, 1993–1994. Gomidas Institute. p. 21. ISBN 978-1-884630-05-7. ^ Panossian 2006, p. 335. ^ "We Are Few... by Barouyr Sevak". Ararat. 21–22: 5. 1978. ^ "System of a Down – Holy Mountains Lyrics". genius.com. ^ "Arto Tuncboyaciyan – Ararat". Sharm Holding production. ^ Hogikyan, Nellie (2007). "Atom Egoyan's Post-exilic Imaginary: Representing Homeland, Imagining Family". In Burwell, Jennifer; Tschofen, Monique. Image and Territory: Essays on Atom Egoyan. Wilfrid Laurier University Press. p. 202. ISBN 978-0-88920-487-4. ^ "Nights are long and dark". Looduskalender.ee. 29 March 2014. Retrieved 11 October 2017. ^ Ter-Sahakian, Karine (29 March 2014). "Armenian community of Estonia: A look into the future". PanARMENIAN.Net. Retrieved 11 October 2017. ^ "'Journey to Ararat' Documentary Film". Golden Apricot International Film Festival. July 2013. ^ Nişanyan, Sevan (2010). "Ağrı il – Merkez – Ağrı". Index Anatolicus (in Turkish). ^ Powell, William S.; Hill, Michael (2010). The North Carolina Gazetteer, 2nd Ed: A Dictionary of Tar Heel Places and Their History. University of North Carolina Press. p. 13. ISBN 9780807898291. ^ Blackman, Emily C. (1873). History of Susquehanna County, Pennsylvania. Philadelphia: Claxton, Remsen, & Haffelfinger. p. 474. ...the locality he selected did not belie in natural features its namesake of Noah's time. ^ "Municipality of Ararat, Victoria". Museums Victoria. In 1840 Wills camped near a large bald mountain which he named Mount Ararat, for 'Like the Ark, we rested there'. ^ Molony, John (2000). The Native-born: The First White Australians. Melbourne University Publish. p. 138. ISBN 9780522849035. ^ "96205 Ararat (1992 ST16)". ssd.jpl.nasa.gov. Jet Propulsion Laboratory (NASA). ^ Abrahamian, Levon (2006). Armenian identity in a changing world. Mazda Publishers. p. 11. ISBN 9781568591858. ^ Mkhitaryan, Lusine (25 May 2018). "Անկախ Հայաստանի անդրանիկ տոնը". Hayastani Hanrapetutyun (in Armenian). ^ Hovannisian, Richard (1971). The Republic of Armenia: The first year, 1918–1919. University of California Press. p. 259. ^ Aftandilian, Gregory L. (1981). Armenia, vision of a republic: the independence lobby in America, 1918–1927. Charles River Books. p. 25. ^ Gunter, Michael M. (2009). The A to Z of the Kurds. Scarecrow Press. p. 9. ISBN 9780810863347. ^ Vali, Abbas (2003). Essays on the origins of Kurdish nationalism. Mazda Publishers. p. 199. ISBN 9781568591421. Movses Khorenatsi (1978). History of the Armenians. Translated by Robert W. Thomson. Harvard University Press. ISBN 978-0-674-39571-8. Arnold, Bill T. (2008). Genesis. Cambridge University Press. ISBN 978-0-521-00067-3. Adriaans, Rik (2011). "Sonorous Borders: National Cosmology & the Mediation of Collective Memory in Armenian Ethnopop Music". University of Amsterdam. pp. 24–27. Archived from the original (M.Sc. Thesis) on March 5, 2016. Dwight, H.G.O. (1856). "Armenian Traditions about Mt. Ararat". Journal of the American Oriental Society. 5: 189–191. doi:10.2307/592222. JSTOR 592222. Bryce, James (1877). Transcaucasia and Ararat: Being Notes of a Vacation Tour in Autumn of 1876. London: Macmillan and Co.
Murad, Friedrich (1901). Ararat und Masis: Studien zur armenischen Altertumskunde und Litteratur (in German). Heidelberg: Carl Winters Universitätsbuchhandlung. Novoseltsev, Anatoly (1978). "О местонахождении библейской "горы Арарат" (On the location of the biblical "mountains of Ararat")". Европа в древности и средневековье (Europe in the antiquity and the Middle Ages) (in Russian). Moscow: Nauka. pp. 61–66. Ketchian, Philip K. (24 December 2005). "Climbing Ararat: Then and Now". The Armenian Weekly. 71 (52). Archived from the original on September 8, 2009. Melkonyan, Ashot (2008). Արարատ. Հայոց անմահության խորհուրդը [Ararat: Symbol of Armenian Immortality] (in Armenian). Yerevan: Tigrant Mets Publishing. Petrossyan, Sargis (2010). "Արարատյան լեռների հին անունների և անվանադիրների մասին [About the Ancient Names and Eponyms of the Ararat Mountains]". Patma-Banasirakan Handes. № 3 (3): 220–227. Antonson, Rick (2016). Full Moon over Noah's Ark: An Odyssey to Mount Ararat and Beyond. Skyhorse Publishing. ISBN 9781510705678. Petrosyan, Armen (2016). "Biblical Mt. Ararat: Two Identifications". Comparative Mythology. 2 (1): 68–80. ISSN 2409-9899. Gregory, S. M. (1920). The land of Ararat: twelve discourses on Armenia, her history and her church. London: Chiswick Press. Elliott, Mabel Evelyn (1924). Beginning Again at Ararat. Introduction by John H. Finley. New York: Fleming H. Revell Company. Yeghenian, Aghavnie Y. (2013) . The Red Flag at Ararat. Introduction by Pietro A. Shakarian. London: Sterndale Classics (Gomidas Institute). ISBN 978-1909382022. Burney, Charles; Lang, David Marshall (1971). The Peoples of the Hills: Ancient Ararat and Caucasus. New York: Praeger. Arlen, Michael J. (2006) . Passage to Ararat. New York: Farrar, Straus & Giroux. ISBN 978-0374530129. Walker, Christopher J., ed. (1997). Visions of Ararat: Writings on Armenia. I.B. Tauris. ISBN 9781860641114. Asher, Armen; Minasian Asher, Teryl (2009). The Peoples of Ararat. BookSurge Publishing. ISBN 978-1439225677. Golden, Christopher (2017). Ararat. St. Martin's Press. ISBN 978-1250117052. Wikimedia Commons has media related to Mount Ararat.